Acer introduces the world’s thinnest laptop, the New Swift 7 (SF714-51T). New Swift 7 is just 8.98mm thin and is also an always-connected PC running Windows 10 that are created for mobility. The laptop has an ultraportable design packing a powerful Intel® Core™ i7 processor, all-day battery life and a personal, trusted 4G LTE connection. The Acer Swift 7’s unmatched slim design is only the beginning of the new features on offer. Blazing-fast, built-in Intel XMM 4G LTE connectivity keeps users productive and always-connected, especially useful for professionals who wish to eliminate tedious wireless connection problems on the road so they can stay focused on the task at hand. In addition to a Nano SIM card slot, the Swift 7 features eSIM technology, allowing download and activation ofeSIM profiles. The Swift 7 ships with a Transatel profile provisioned with up to 1 GB of free data valid for one month in 48 countries to help users get started immediately. While additional data plans can be easily purchased as needed through the Mobile Plans application while travelling around the world. 802.11ac wireless with 2×2 MIMO provides reliable and fast connections to the office or home network. Powered by a 7th Gen Intel® Core™ i7 processor, the Swift 7 provides incredible performance, a seamless Windows 10 experience and up to 10 hours of battery life. 256GB of PCIe SSD storage offers plenty of room to keep important files at the user’s fingertips, while 8GB of LPDDR3 memory keeps multitasking smooth and responsive. A fingerprint reader allows password-free and more secure sign-in through Windows Hello. The Swift 7’s unibody aluminium chassis is pleasing to the eye and gentle to touch, perfect for modern professionals seeking a sophisticated look. Its new high-resolution display has been upgraded to 14-inches, and sports a Full HD IPS display, Acer Color Intelligence™ for lifelike clarity at every angle, as well as a Corning® Gorilla® Glass NBT™ touchscreen and touchpad. Typing has never been easier thanks to the Swift 7’s backlit keyboard, which is handy in low-light conditions such as long-haul international flights or train journeys. 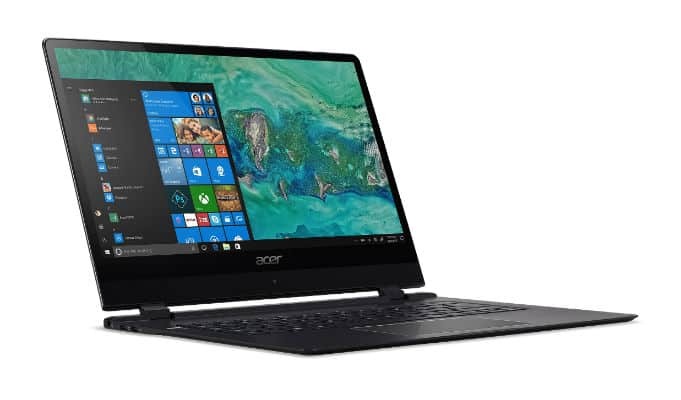 Acer has also announced its refreshed Spin 3 (SP314-51)laptop, designed for users seeking out a versatile device for all-day productivity and entertainment. Its durable 360° dual-torque hinge enables it to function as a laptop, tablet, display and even provides a space-saving tent mode, all in a single device. Now equipped with a powerful 8thGen Intel Core processor and impressive storage options, the Spin 3 merges exceptional performance with portability. It provides up to 12 hours4of battery life for digital work and plays on the move, with two front-facing speakers with Acer TrueHarmony™ technology. The Spin 3’s 14-inch display supports vivid imagery in Full HD with IPS technology, allowing on-screen content to shine through in exceptional detail. Based on Acer’s internal survey as of January 5, 2018, of competing for clamshell laptop designs available on the market, running Windows OS or OSX.